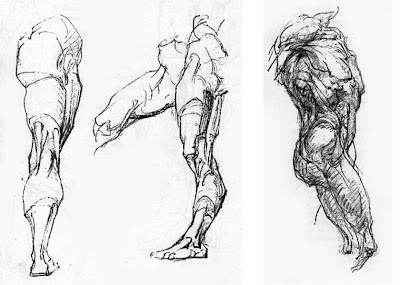 One of the most recommended books on anatomy is Bridgman's Complete Guide to Drawing from Life . While admittedly a great book, it can be a bit hard to follow. From Bridgman's chaotic, yet beautiful linear drawings, (made all the more difficult to follow by poor reproduction) to the somewhat erratic presentation of the text (due to the book being little more than a cobbling together of notes from his students) it can be very intimidating to the novice artist. 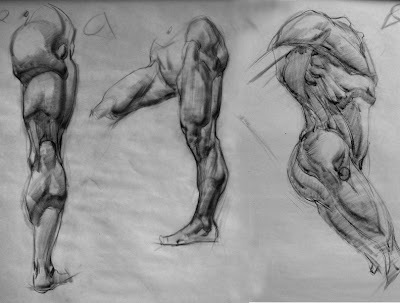 The way I was taught to study Bridgman by Jeff Watts was a three tier process. is the final drawing done in conte or graphite? the final drawing is done in conte. Thanks I wish I could take credit, but I believe Jeff came up with it. now that helps, alot. tnaks for sharing the pointers you were taught. Heh. You're right -- female body builders have some of the most excellent male physiques. Them, and farm boys. Nothing is more distracting in a picture than Nautilus gym bodies escaped into the wild. Nice post here, Erik. Very clear. I'm excited about the class this term. Good level of rigor. 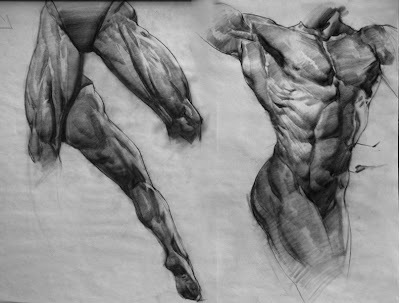 I'm hoping to actually remember some anatomy this time. This has been a great help, I was looking at Bridgmans books thinking, how am I supposed to copy this and learn from it? Thank-you a lot!